Our team has a daily scrum at 8:30 AM. Kenneth, our scrum master, forgot to update his tasks. He pinned two post-it on the in-progress column. He was penalized for a level one treat because of this. It was usually banana cue they buy at Jollijeep. As for the 2L bottle of Pepsi, it was Justin’s. He was late twice in our scrum so he was also punished. Before, when I was the scrum master, I also forgot to update my tasks so I bought banana cue for them. Hihihi. 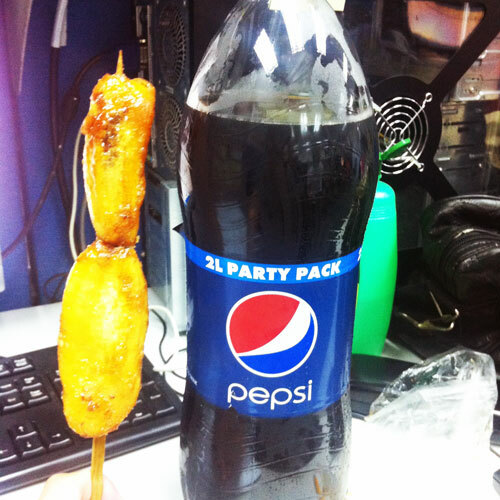 This entry was posted in Daily Me, Food Corner and tagged banana que, food, pepsi, softdrinks. Bookmark the permalink.